There is nothing more frustrating than setting up the biology microscope, only to be unable to view a clear image. Below are a few trouble shooting pointers that may help! When I look through my light microscope, I only see a dark outline of my sample. Hold your slide up to the light. Are you able to see through the sample? If not, your sample is too thick. Try making another sample and slicing the specimen a bit thinner. (Kids your parents can help with this!) If you think you have the thinnest sample possible, try increasing the light (many microscopes have a rheostat control on the light). If neither of these suggestions work, try simply holding a flashlight above your sample. You won't be able to see through the sample, but it may illuminate the sample enough so that you can still view the surface of your specimen. I can not locate my sample on the slide! Always start with your microscope set to the lowest magnification (usually the 4x objective on your light microscope). Find the edge of the slide closest to the sample then slowly move the slide toward the area where light is shining. Once you get the sample into focus in the center of the microscope light, move the magnification up to 100x, then 400x. My slide is spilling liquid all over the stage. The best solution for viewing liquids is to use a depression slide with a cover slip. Use an eyedropper to place just a single drop of fluid in the well depression, then cover it with the cover slip. This should seal the liquid between the slide, flattening the specimen out enough to view it, without spilling your sample all over the microscope stage. I am using a trinocular microscope, but when I look through the eyepieces the image is black. Make sure the beam splitter is not engaged! This is the small rod that when activated, will block light from the eyepieces and send it up to the camera. 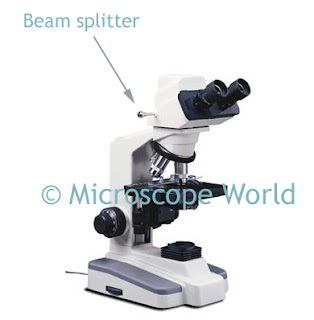 Digital microscopes (with a camera built into the microscope) will usually also have a beam splitter.